Blumaroll is retired! As of spring 2013, dice packs are no longer usable and you may no longer play. The NC Mall presents: Blumaroll! This dice-based game is very similar to JubJub Power Bounce--in order to play, you must obtain dice packs with Neocash, meaning you must spend real money. However, the dice packs and the game itself will only be available for limited times during the year (think of it as a traveling carnival). For prizes, you can only choose an item from the shelf corresponding to the side your die lands on. Blumaroll will roll in and out of the NC Mall with new item offerings each time it's back. Your activated but unused dice will remain in your account and you will be able to use them the next time Blumaroll comes back. You can play Blumaroll on side accounts. Note: In Fall 2011, the price of the Blumaroll Dice 10-Pack decreased from 900 NC to 800 NC. 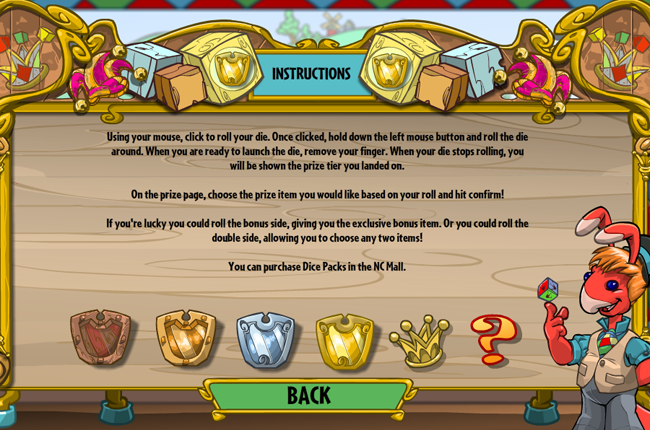 Once you have a Dice Pack in your inventory, click on it and select the "activate" option. Then proceed to the game. Use up a die from your activated dice pack to play. 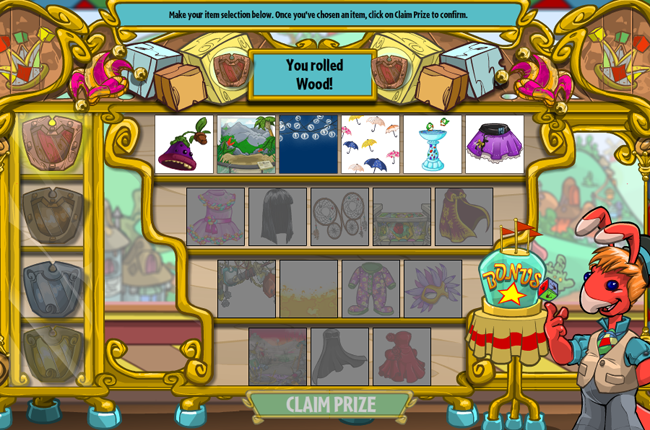 When the die lands on a side, you will be able to select an item from the corresponding prize shelf. If your die becomes glitched or you accidentally close the window, you can refresh or come back to the game and you'll be able to resume (it won't take an extra die from you). New Travelling Cases have been released into the mall, offering a selection of retired Blumaroll prizes. Each case also has the chance of awarding one of three bonus items that are completely new and themed against the prize set the case relates to. They follow the same mechanics as Mystery Capsules, offering one or more items upon opening, and randomly awarding a bonus if you're lucky. All six cases were available until May 6th, 2013, and marked the end of Blumaroll. View all Fall 2012 prizes! View all Summer 2012 prizes! View all Spring 2012 prizes! View all Fall 2011 prizes! View all Summer 2011 prizes! View all Spring 2011 prizes!